CLOSEOUT SALE! This product is being discontinued. When the limited stock is gone it will no longer be available. See Model 234 for similar product. Simple Shoulder Holster. 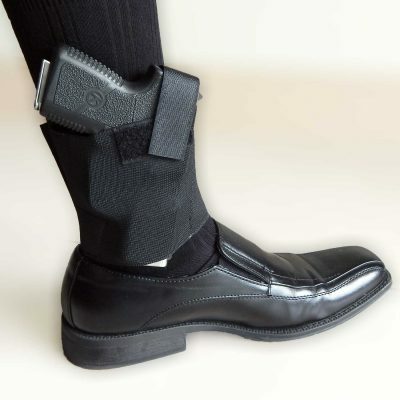 Carry your handgun, comfortably, secured and with instant access! The sleek, lightweight design of the Simple Shoulder Holster will carry a compact handgun in a horizontal position and offers great weight distribution for extended, all-day concealed carry comfort and concealability. HARNESS: The thin, lightweight half-harness is fully and easily adjustable to fit most torsos. FRONT STRAP: The specially contoured front strap, made from Cordura and nylon webbing, is wider across the shoulder for comfort and weight distribution. It is padded with a non-slip material that stabilizes and prevents it from slipping or sliding, even with heavy guns. Includes a one-inch elastic strap that won’t restrain your movements, with a solid brass suspender clip, that firmly fastens to your pants for maximum stability. DESIGN: Simple Shoulder Holster’s Open muzzle design allows the use of guns with different barrel lengths. QUALITY PRODUCT: Made of waterproof foam for a comfortable carry and to protect the gun from moisture and lined with rugged Cordura® nylon for durability and a smooth, fast draw. THUMB BREAK: Includes removable and adjustable thumb break, that fits multiple guns, for quick, easy access and to keep your gun secure. They are made with high-quality snaps and steel reinforced to ensure a quick and precise release every time. COMBAT GRIP: Provides a full combat grip. FAST DRAW: Allows for a smooth, fast draw even while seated. CHEST SIZE: Fits up to 52″ chest. HANDGUNS: Made for small to medium size handguns. This card reveals, step-by-step, exactly what to do after the confrontation ends and the confusion begins. It contains vital information to protect you! If you carry a gun for protection, you can’t afford to be without this card in your wallet or purse. Now you can get this card absolutely free, just by trying the Simple Shoulder Holster! Notice: This holster is designed for maximum concealment, and is NOT intended for one-handed re-holstering and should not be used for such applications.